M2R is a series of musical multi-sensory compositions, performances and installations encouraging audiences to listen differently, paying greater attention to small sounds and musical changes. Ii is music not only heard, but also seen and felt. This research will redefine a starting point for musical composition and listening by creating an experience that is uniquely open to possibilities for listeners of any kind. The project consists of works for piano (Kate Halsall), bass clarinet (Gareth Davis), and electric viola (Nic Pendlebury). I am very pleased to have been awarded an 'Individuals Award’ from the PRS for Music Foundation to support the composition of the second and third of these works. As well as these wonderful, creative performers, I am working with sound designer/programmers Carl Faia and James Waterworth as well as consulting with both Music for the Deaf and the Music House for Children, London. Sound artist and Brunel University technician Phil Maguire is a constant source of help and encouragement with my trial-and-error approach and my electronic endeavours. Following my pilot piece Hanging In The Balance (for piano) research is further exploring ways that the solo instrument can stimulate objects placed around it to vibrate in sympathy and so form a new sonic environment. I am also utilising visual representations via software projections and exploring ways of exciting other surface and physical materials such as water and glass. 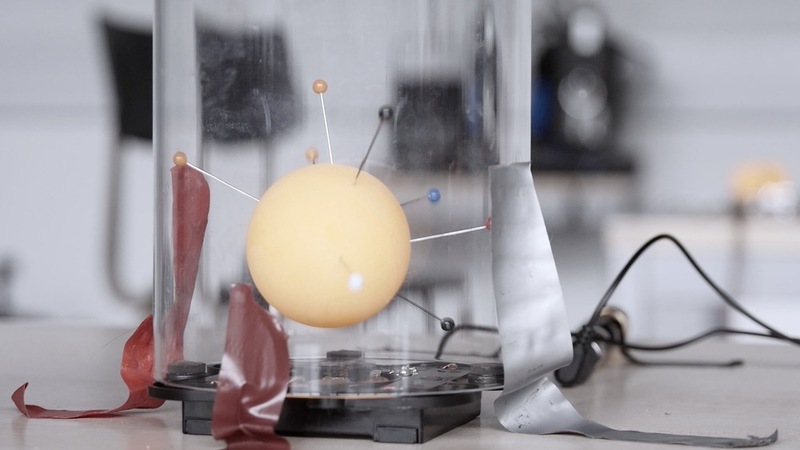 Hanging In The Balance was part of Kate Halsall's Miniaturised Concertos Project (funded by the Arts Council of England), and the piece features on her new album released in April 2016 (Metier). The project arises from three overlapping areas of social, medical and musicological research. The social context is the current crisis of attention and listening. Too often we take listening for granted, saturating our personal space with sound; an aural overload. Since the turn of the century, through the mass-marketing of portable listening devices, in-ear audio has become ubiquitous. Our cognitive ability to focus on detail has been diminished and its intrinsic value is being eroded through an emerging and pervasive praxis resulting from the same overexposure syndromes affecting contemporary society (a plethora of information leading, paradoxically, to a reduction in bandwidth transmission).1 Hearing and listening are fundamentally different and it is precisely this difference that M2R wants audience to tackle. Research in the medical sciences had led to striking developments for those with hearing impairments. Public health concerns are, in part, fuelling this research; an ageing population means hearing loss is set to grow.2 Increasingly sophisticated cochlear implant technology enables people to hear sound in a limited way where previously their world was silent. The sense of wonder at hearing for the first time can inspire new ways of looking at musical composition and the modes of performing and listening. What might just be background noise to many becomes a fascinating symphony to a first-time-listener. https://www.youtube.com/watch?v=j6DHhM4PgVA. How can all audiences regain the wonder of listening? Composers and audiences have much to learn from those with hearing loss. In musicology, much research has considered new ways of generating sound through electronic and computer manipulation. 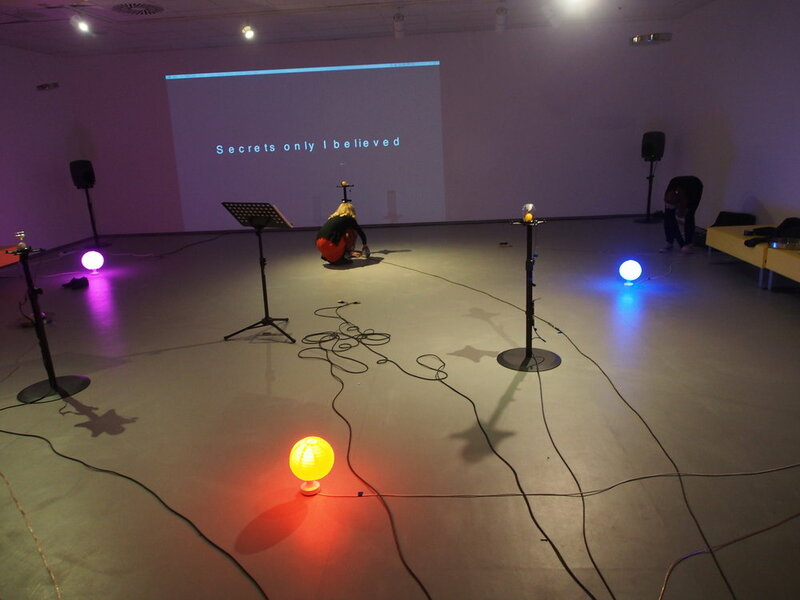 Resonance was explored in drone-based works such as Lucier’s Music for solo Performer (1965) and Tudor’s Rainforest (1968) where loudspeakers are utilised as instruments in themselves, and by more recent composers such as Nicholas Collins (Pea Soup, 1974) and Christian Marclay (Sixty Four Bells and a Bow, 2009). Much rarer is the successful combination of a cohesive and mutually-enhancing balance between the sonic dimension (the construction of objects, mechanisms, applications of acoustics, and computer processing) and the composition itself. 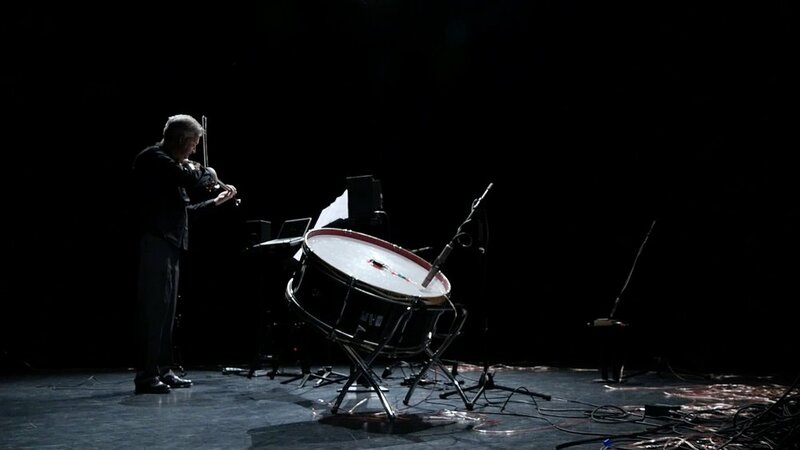 Few compositions have explored how harnessing both acoustic resonance and electronically-manipulated sound can complement a solo performer. To extend artistic practice, composers need to shift the point of departure and start from the perspective of first–time listeners. Having observed snare drums rattling in time with my piano playing in many a practice room, I realized that here was something I could harness to provide ‘accompaniments-with-a-difference’ for piece for solo instrument. 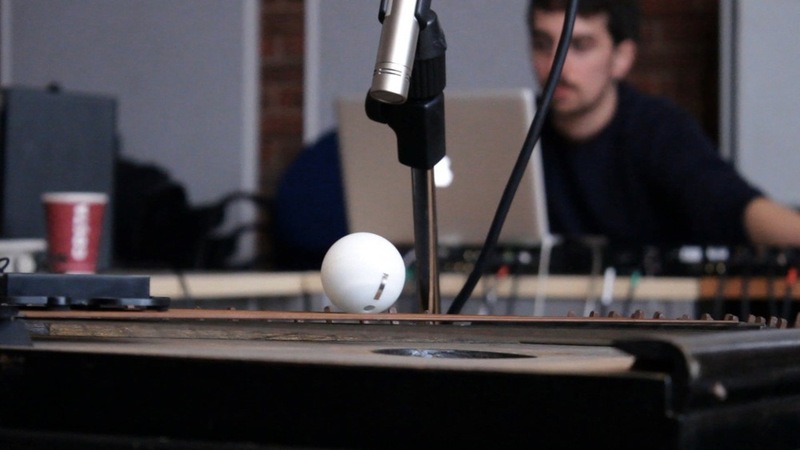 Hanging In The Balance is the first of a set of pieces which explores bringing objects to life by stimulating them to resonating along with the music played by the soloist. The piano music is sent via transducers to the skins and working parts of various instruments placed around the stage and made to buzz, rattle and shake. The four instruments for this piece are a bass drum, a snare drum, a hi-hat and a zither. This sets in motion a chain reaction of music events whereby each sound is in turn developed further away from the original source. The final stage is through electronic manipulation. The whole piece sets in place a sensitive balance of all its disparate parts. The scored material allows space for the resonating of the four percussion instruments, which also leaves room for sonic manipulation. It explores sounds that are at the edges; broken sounds, extremely quiet sounds (amplified), mangled sonics, prepared piano, muffled notes, harmonics, feedback, and electronic shifting into extreme registers. Across it’s three movements, the music explores small fragments of music obsessively making use of transformations through timbre, and ever-shifting arrangements of the key elements. The realization of the electronic elements was done using Ableton Live software and with the guidance and patient expertise of James Waterworth (DJ and sonic artist). 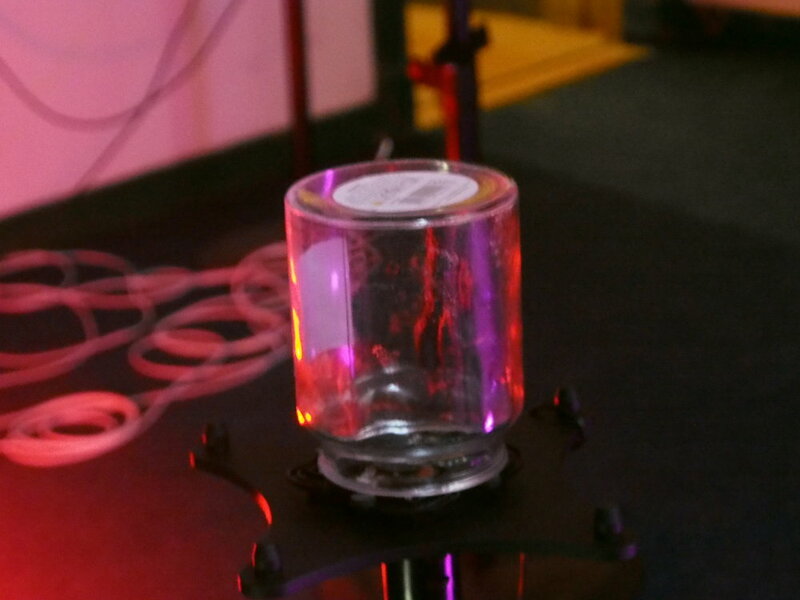 Hanging in The Balance was commissioned by Kate Halsall as part of her Miniaturised Concertos Project with funds provided by the Arts Council of England. Following a 4-day residency we have created a musical event that is an experimental hybrid; a piece of music, a sound installation and an educational experience. The aim is to challenge the way we listen to sound in a playful context full of illusion and surprises. This is the beginning of the process for us. The opportunity to perform this 6 times in the Suttie Arts Space for a whole range of different listeners means that we can develop the piece is ways that we had not thought of before our residency. 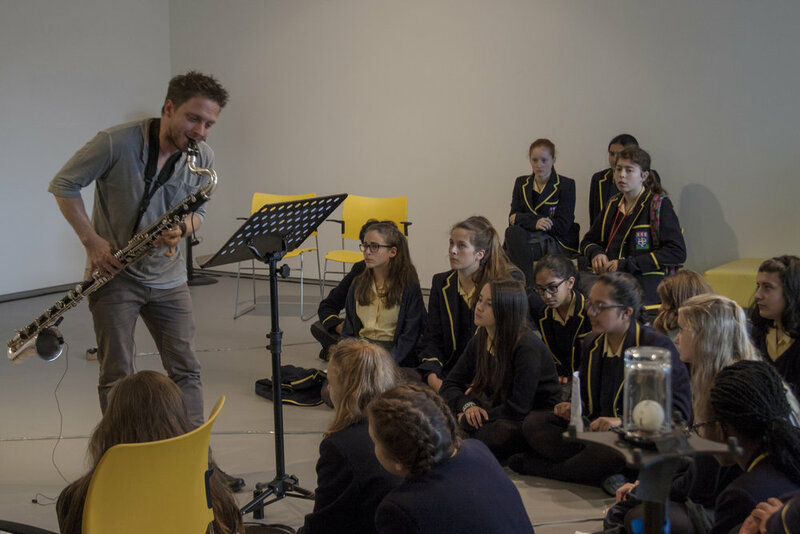 The musical creators along with the audiences are all part of the experiment. We have created created 15 minutes of music which is as much seen and felt as it is heard. The music, because of the many layers, can be experienced on different levels and be something challenging and evocative to all listeners. The piece engages with musical notes, patterns, text, light, colours, transformations, physical energy, physics, and theatre in its effort to challenge and entice its audience. The piece makes use of common household materials such cardboard, paper, glass, metal, paper and wood in such a way as to make them unfamiliar. The space you are sitting in is a kind of sound booth or box of memories. It is full of connections and possibilities. The sounds of the bass clarinet and the various scattered objects are heard in close-up. There are also distant intangible sounds, processed by the computer, which form a kind of aura around the edges of the room so that there is a constant mixture of the acoustic and the electronic. Taking Michael Rattee’s poem about ‘remembering’ as a guiding structure, the music sets up a heightened dream-like world where the voice of the solo clarinet is a kind of ‘song-without-words’. The piece divides into 4 equal sections. 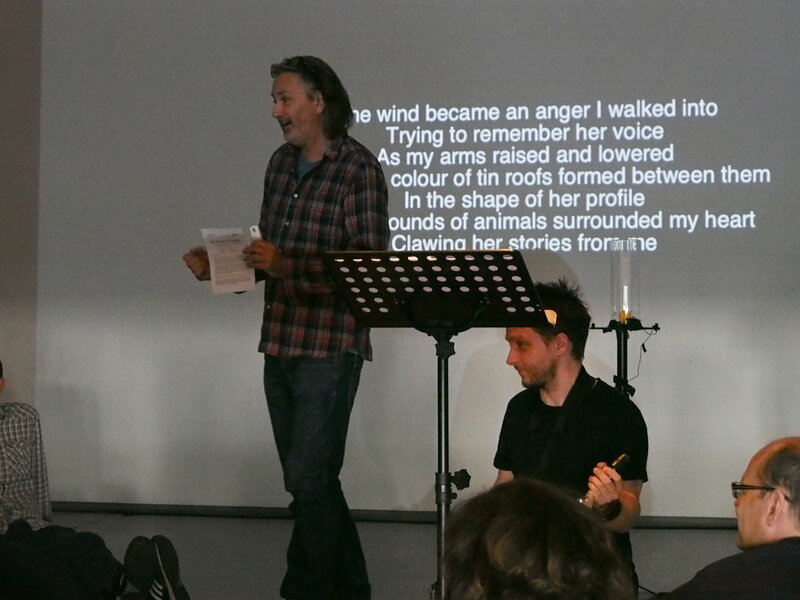 Thanks to Fiona Robertson and Kadri Soerunurk (Sound Festival), Pete Stollery and Adam Cresser (University of Aberdeen), Jim Ewen (Anatomy Rooms), Tasmin Greenlaw and Fraser MacDonald (Suttie Arts Space), all at TechFest, and to the poet Michael Rattee. The first performance was in the Artaud Performance Theatre, Brunel University on 15th March 2017.